Showing 45 articles from July 9, 2014. YOUNGSVILLE — For Dave and Pat Carnie, PSNC Energy’s need to install a new transmission line through Franklin and Wake counties represents the good, the bad and the ugly. They have a home in the vicinity of Darius Pearce Road and U.S. 401. One of the company’s possible 60 route options appears to come through their property. The good? If the line comes just close enough, the couple will be able to tap onto a lower cost energy option. LIGHT UP THE SKY. 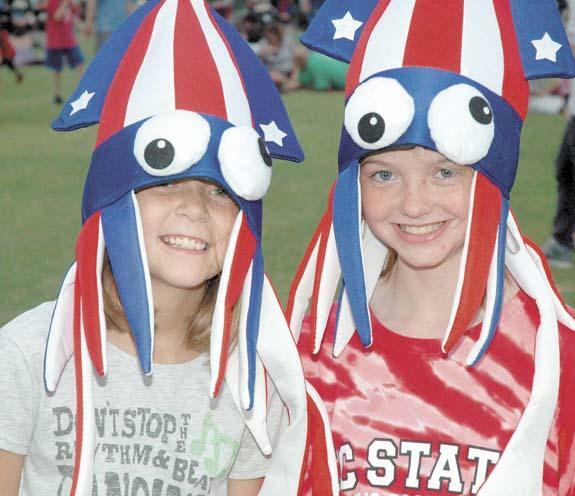 Thousands of visitors showed up at the Franklinton Middle School football field to watch fireworks that capped the Stand Up For America festivities held in Franklinton on July 3. 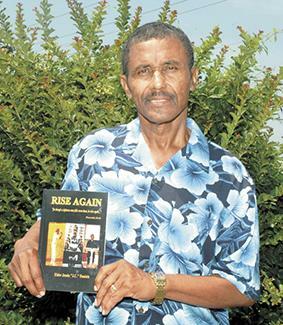 LOUISBURG — Former Louisburg College baseball star Jessie Daniels has fallen, a lot. After a spectacular career for the Hurricanes, he was drafted in the second round of the 1977 Major League Baseball draft. But, after signing a rookie deal with the Los Angeles Dodgers in 1977, he fell out of favor with his minor league manager during an incident he believes played a part in his release a year later. LOUISBURG — After questions arose about the low bidder’s level of work, as well as its ownership consisting of a county department head, commissioners decided to rebid a landscaping contract. The county awards the contract on a three-year cycle and commissioners have awarded the contract to A OK Lawn Care and Landscaping and its owner, Phillip Champion, the last two cycles, at least. Apparently that’s what the big city folks think of our little part of the world, the part most of us have long considered the center of the known — or at least relevant — universe. The term outskirts was coined by some newspaper headline writer, probably in Charlotte, writing a headline for the venerable News & Disturber recently. And it happens far more often than most of us realize — and takes a toll far beyond what’s reported in the headlines. The “it” is domestic violence and it is a part of this community just as it is a part of other communities across the nation. 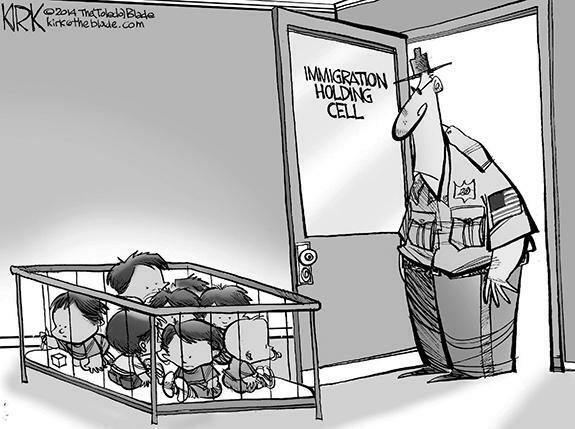 Full disclosure: I once left a child at a day care. I dropped two kids off that morning at different day care places. They needed to be picked up at 5 p.m., but I got caught up in a story. When I glanced at the clock, it was 4:55 p.m. I dashed out, picked one of the kids and dropped him off at the house. Week to week, for months, I have seen the Chairman of the Franklin County Democratic Party’s never ending campaigning against North Carolina Republican State Sen. Chad Barefoot in the column he writes in this paper. 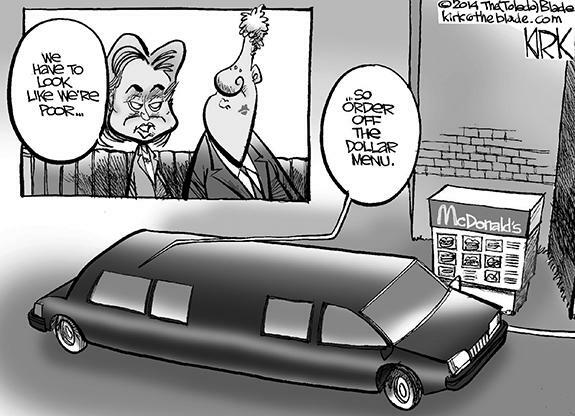 For the Democratic Party and Barefoot’s challenger in particular, this is a pretty good deal. They get the benefit of the advertising without having to pay for it. I suspect this will continue up through the November general election. Climate change and its ramifications are no doubt real. It is popular among the Flat Earth Society to deny it, but deny as they may, it doesn’t change reality. What is open to discussion is just when and to what degree things will change. 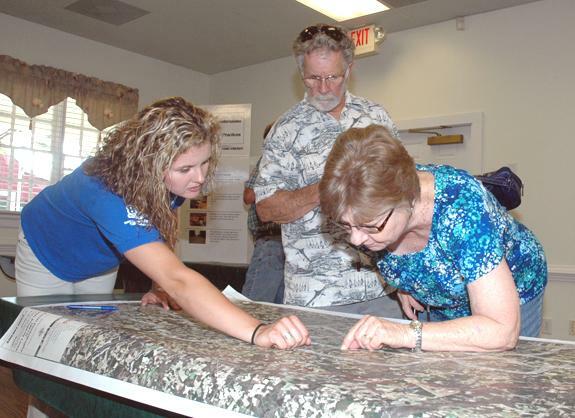 In the June 24th edition of the Washington Post, one of the world’s five most influential newspapers, North Carolina again became a source of humor in Lori Montgomery’s article: On N.C.’s Outer Banks, Scary climate-change predictions prompt a change of forecast. Dear editor: In 1933, President Franklin Roosevelt was in office. During that same era, the two-laned Highway 401 was built; that was over 80 years ago. Now it’s 2014, and even though most of the counties surrounding Wake County have four lanes to Raleigh, Franklin County is still stuck with our treacherous, hilly two-lane 401 highway. BUNN - Funeral services for Emma Davis Williams, 73, who died Sunday, July 6, 2014, will be held at 12 p.m. Saturday, July 12, at Richardson Funeral Home in Louisburg. Burial will follow in the M.H. Jones Cemetery. 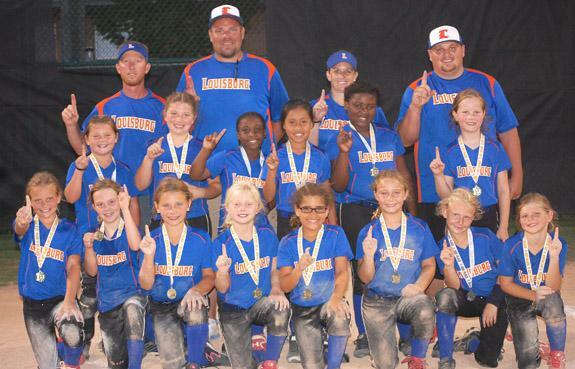 KNIGHTDALE -- Louisburg’s All-Stars left little doubt as to which team was tops at the Tar Heel Coach-Pitch District Softball Tournament. 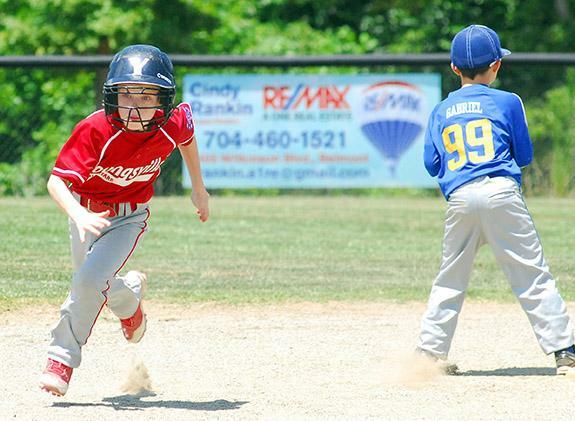 Louisburg rolled through the competition at the annual event and capped off its district crown by defeating Wendell on Tuesday at the Knightdale Community Park. PETER THE GREAT. Youngsville All-Star Pete Honse blasts a hit up the middle during last Saturday afternoon’s action versus Boger City at the Dixie Youth Coach-Pitch State Baseball Tournament in Stanley. STANLEY - Youngsville made a bit of history with its second-place finish at the Dixie Youth Coach-Pitch State Tournament. But the journey is far from over for Youngsville, which used its runner-up performance to earn a spot in the upcoming nationals in Texarkana, Arkansas. 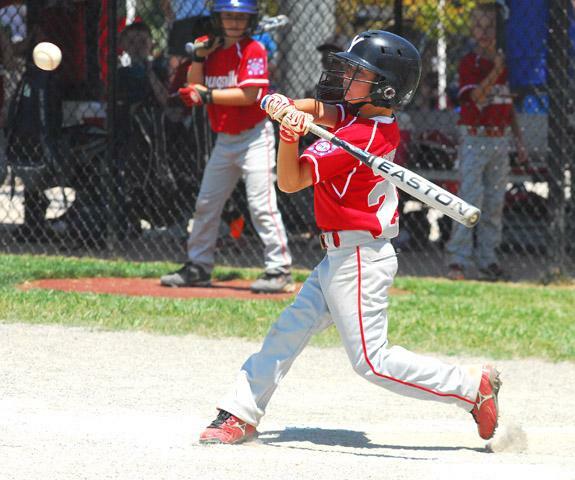 Each state champion is given a preference to choose between the machine-pitch or coach-pitch national formats. CAUGHT IN A RUNDOWN. Louisburg’s Matthew Thomason (left) makes a tag to complete a rundown during Monday’s contest against Nash County at the Tar Heel 11-12 Baseball Districts. LOUISBURG -- A whopping 31 total runs were scored when Nash County lined up against host Louisburg on Monday in the opening round of the Tar Heel District 6 11-12 Baseball Tournament at Warrior Field on the campus of Louisburg High School. 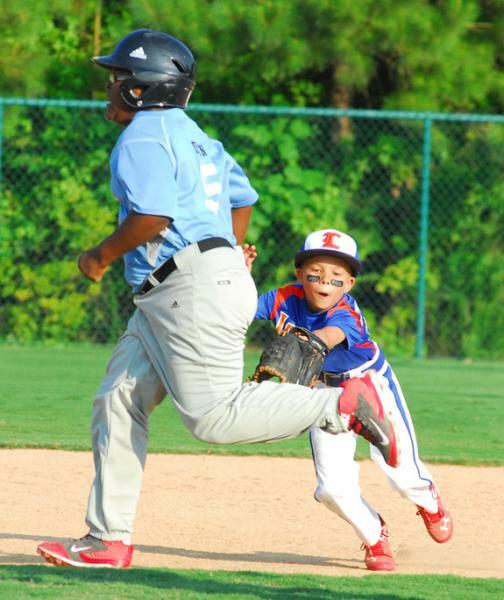 Fortunately for Nash County, the visiting All-Stars delivered 20 of those runs en route to securing a 20-11 decision over Louisburg in a high-scoring showdown on the first day of the double-elimination format. CHAMPION’S CLOUT. Louisburg’s Will Champion prepares to swing during Tuesday’s action at the Tar Heel District Coach-Pitch Baseball Tourney in Knightdale. KNIGHTDALE -- After winning a one-run thriller over Nash County to open the event on Monday, Louisburg couldn’t sustain its momentum one day later in the second round of the Tar Heel District Coach-Pitch Tournament. 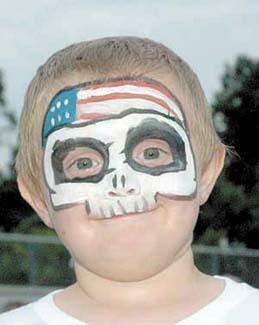 Instead, Louisburg never led and was defeated 11-5 by Wendell at the Knightdale Community Park. The setback put Coach Chad Champion’s club at 1-1 overall in the double-elimination format heading into Wednesday’s action. BUNN -- Already the recipients of an outpouring of accolades this season, Bunn’s Spencer Brickhouse and Christian Sledge added another honor to their impressive list earlier this week. Both Sledge and Brickhouse earned spots on the North Carolina Baseball Coaches Association list for the Class 2-A level. A total of 33 recipients were saluted from across the state, including Bunn’s Dynamic Duo. LYNCHBURG, VA. -- The Carolina Mudcats uncorked four wild pitches and a passed ball that lead to three runs in a 5-4 loss to the Lynchburg Hillcats on Monday night at Calvin Falwell Field in a Class A Carolina League baseball contest. The Mudcats (10-9, 39-47) have dropped three straight and the Hillcats (9-9, 43-45) scored their first home win over Carolina. BUNN -- Bunn’s teams combined to score 20 runs -- and allow zero -- during a Central Carolina Scholastic League baseball doubleheader on Monday against the Enloe Eagles. 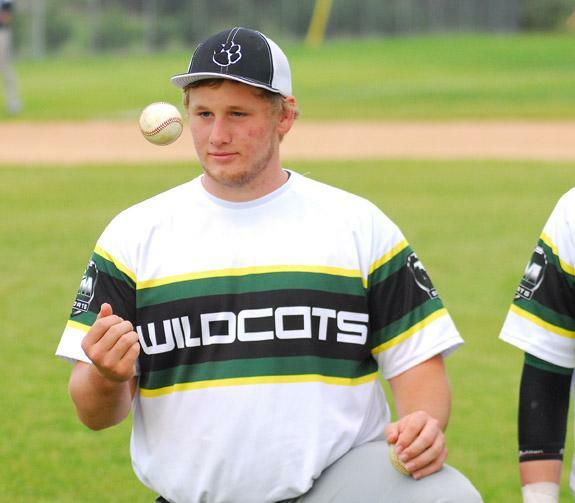 Bunn’s varsity squad rolled to a 10-0 triumph, and the Wildcats’ junior varsity contingent picked up a victory by that identical score at the BHS Baseball Field. HENDERSON -- The Carolina Panthers Play 60 Football Camp will be held July 18 beginning at 8 a.m. at Freedom Life Church on Martin Creek Road in Henderson. Youngsters in grades 2-7 are invited to attend the camp. Adult volunteers are also being sought. The Carolina Panthers Play 60 Camp brings the excitement and experience of an NFL Training Camp to children, in an effort to increase their interest in team sports and inspire a healthy and active lifestyle. LOUISBURG -- The 13th Annual Safe Space, Inc. Golf Tournament will be held on July 25 (rain date on August 1) at Green Hill Country Club in Louisburg. Registration and lunch will be at noon with a tee-off at 12:30 p.m.
For fees and other information or to register, call Darrell Perry at (919) 496-2153 or Safe Space Office at (919) 497-5599. 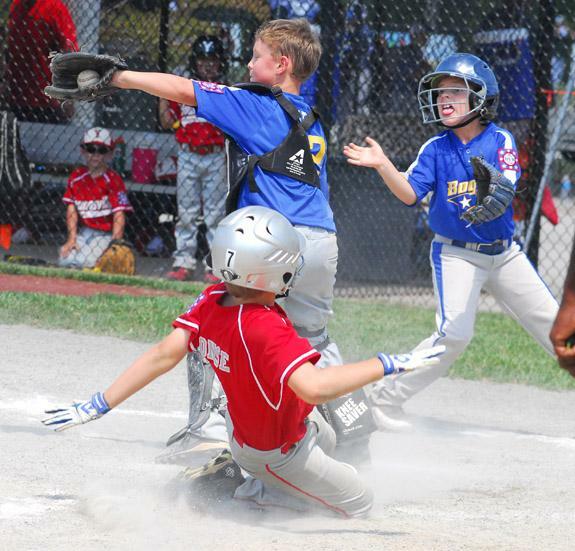 FRANKLIN COUNTY -- After winning the Dixie Youth Minor League District Tournament last week, the Youngsville All-Stars will compete beginning next weekend at the D-Y State Tourney. 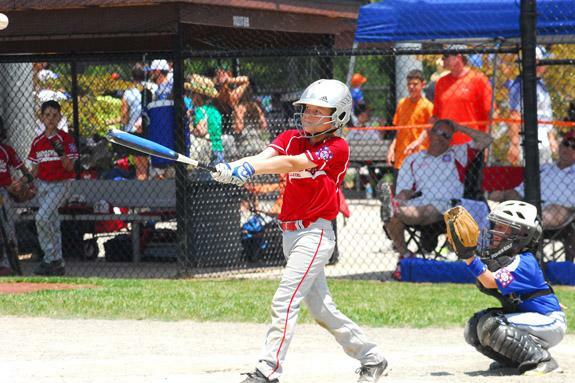 The event, which utilizes a double-elimination format, will be held starting July 18 at Freedom Park in Eden, which is located in Rockingham County. 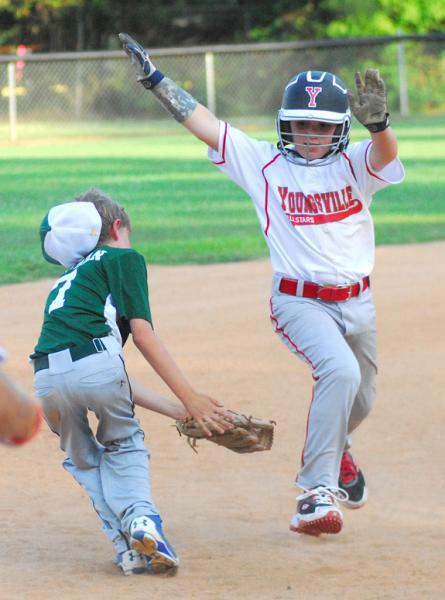 Youngsville’s first game will be that Saturday at 2 p.m. Tickets will be available at the gate. LOUISBURG -- Louisburg College’s 2014 men’s soccer schedule will begin Aug. 26 with a home meeting against Region X foe Wake Tech Community College. This will be Coach Cristian Neagu’s third season in charge of the tradition-rich program. ROCKY MOUNT -- Since 1999, North Carolina Wesleyan College has honored 56 former athletes, administrators, teams, coaches and contributors by enshrining them into its Athletics Hall of Fame. Louisburg All-Star first baseman Wyatt Hayden (left) lunges for a throw during his team’s matchup on Monday against Nash County at the Tar Heel 11-12 District Baseball Tournament. 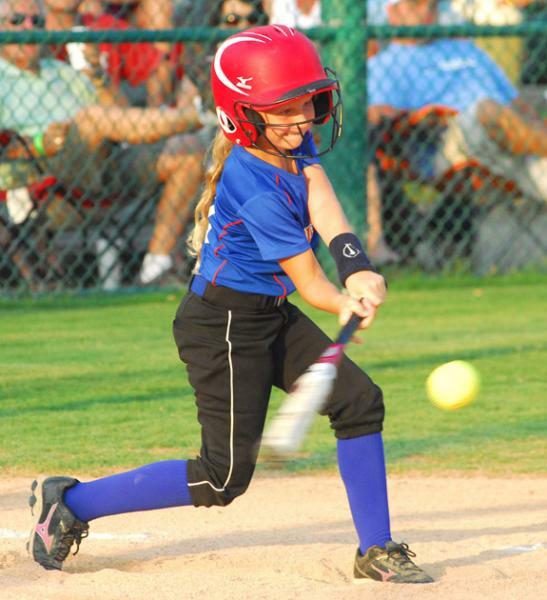 The event is being held this week at Louisburg High School’s Softball Field. Coaches and players from the Louisburg All-Stars pose after winning the Tar Heel District Coach-Pitch Softball Tournament on Tuesday night at Knightdale Community Park. Louisburg defeated Wendell to claim the crown and advance to the state event. Louisburg’s Tyler Douglas tries to reel in a throw at third base during Tuesday’s game. Louisburg’s Darius Collins scores a run Tuesday night against the Wendell All-Stars at the Tar Heel District Coach-Pitch Baseball Tournament at Knightdale Community Park. Louisburg’s Will Champion (right) makes a force play near second base during his team’s contest against Wendell on Tuesday at the Tar Heel District Coach-Pitch Baseball Tournament in Knightdale. 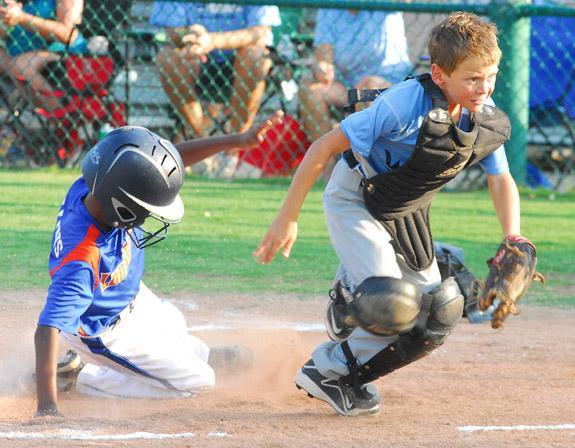 Youngsville’s Peter Honse slides home for a run last Saturday afternoon against Boger City. 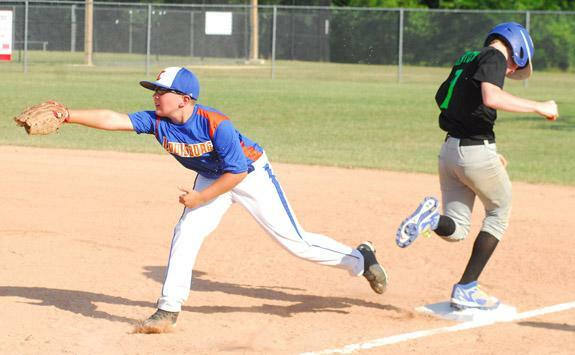 Youngsville’s Jake Roberson (left) speeds toward third base during his team’s victory over Boger City at the Dixie Youth Coach-Pitch State Tournament. 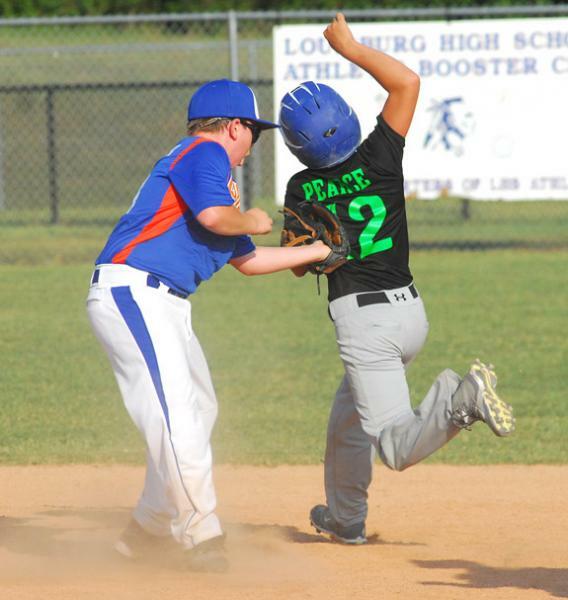 Connor Hopkins (right) and the Youngsville All-Stars will be in action beginning this weekend at the Dixie Youth Minor League Baseball State Tournament in Eden (Rockingham County). 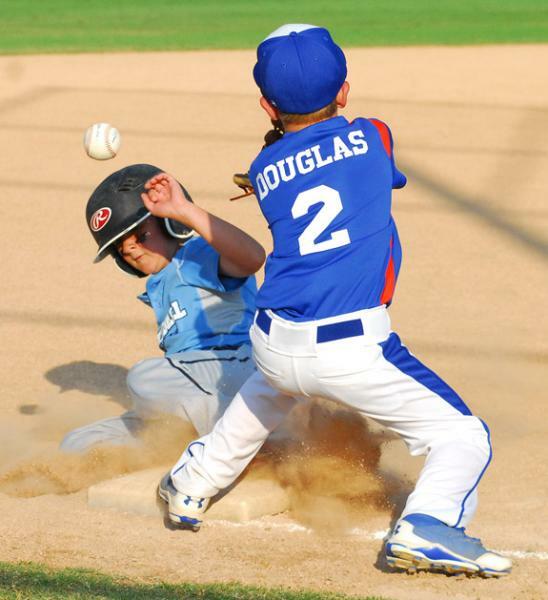 The Youngsville All-Stars won the D-Y District Tourney last week. 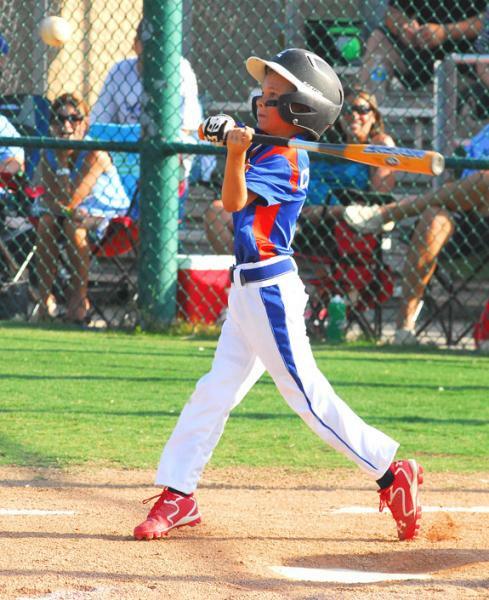 Rett Johnson has enjoyed a strong postseason at the plate for the Youngsville Coach-Pitch All-Stars. Samuel Cannady Vann, a merchant in Franklinton, made a business decision in the mid-1890s that had a lasting impact on the local economy. He purchased 10.9 acres of land adjoining the Raleigh and Gaston Railroad and, in 1895, incorporated the Sterling Cotton Mills. Scott and Gaye Champion of Huntersville, N.C. announce the upcoming marriage of their daughter, Megan Scott Champion to Matt Wilson of Franklinton. The groom-elect is the son of Charmin Medlin of Franklinton. 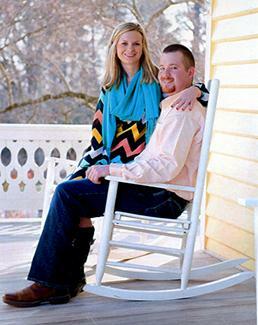 An Oct. 4, 2014 wedding is planned at The Timberlake House in Louisburg. The Mertha Lee Crudup Scholarship Fund presented its annual scholarship recently at Popes Chapel United Church of Christ during the Sunday graduation program. This year’s recipient is Derryan Henderson. 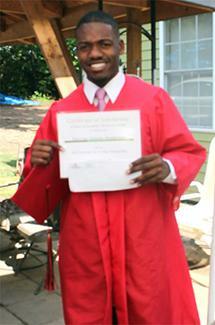 Derryan, a graduate of Franklinton High School, will attend North Carolina A&T in the fall. BUNN — The Bunn rescue squad is repairing its building after a Raleigh woman crashed into the metal structure, apparently texting while driving. According to police, Nicole Ross was driving west on N.C. 98 coming into town when the Chevy she was driving ran off the road the afternoon of July 3. FRANKLINTON — A domestic dispute led authorities to charge a Franklinton-area man with reckless driving and assault with a deadly weapon. A 35-year-old woman reported to sheriff’s deputies that on the evening of July 3, she felt threatened by a voicemail from her estranged husband. YOUNGSVILLE — Deputies arrested an Oxford man on charges that he was trying to steal from a business. According to a report by Dep. 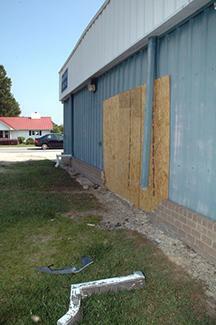 K. Fisher, officers responded to an anonymous tip that someone was stealing air-conditioning units from Mullis Millworks Co. in the 5400 block of N.C. 96. When Fisher arrived the afternoon of July 6, he found a man, later identified as Renni Peirce, run from behind the building. 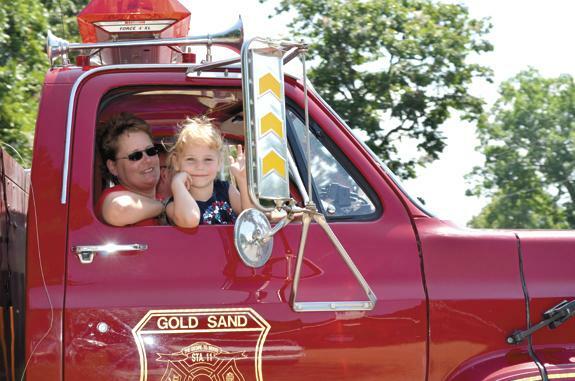 Gold Sand firefighter Elaine Ayscue and her granddaughter, Emma Grace Faulkner, 5, were part of the traditional Fourth of July parade in Alert on Friday — and were all smiles as they waved at the crowd. 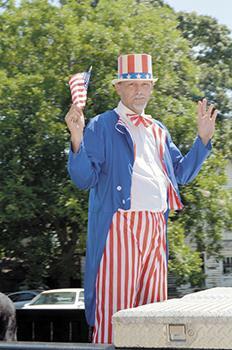 Kenneth Radford as Uncle Sam? Ashleigh Heitzman and Autumn Norwood decked out in patriotic gear.